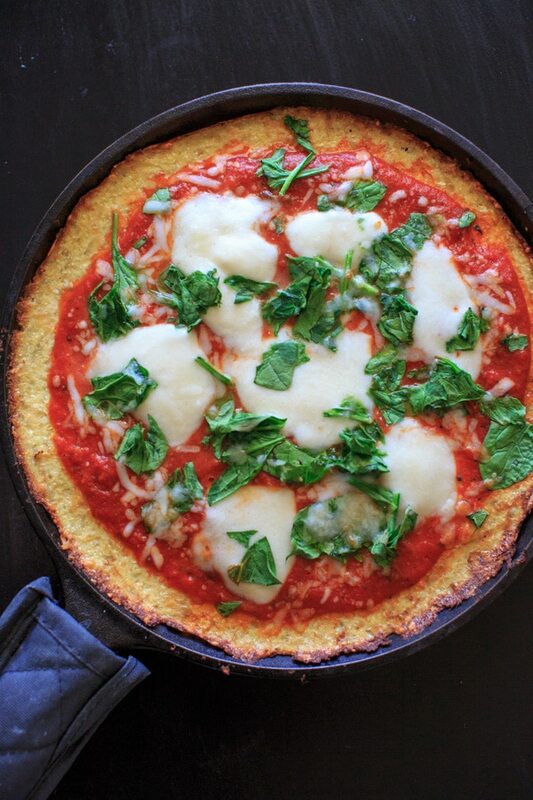 Cauliflower pizza crust – for those days when you really want pizza but not all the carbs, or need a gluten free alternative. Okay, I did it. I jumped on the bandwagon. That pizza picture? That pizza crust is made out of cauliflower. Say what? For those in camp #3, please bear with me. Don’t get me wrong, this does not miraculously taste like real pizza crust in all it’s carb-loaded glory. But if you are someone like me who would choose to eat pizza for every meal the rest of your life if you could, this could be a good one to try out. If you’re still here, read on for some tips. Take one medium cauliflower head and remove the florets from the stem. 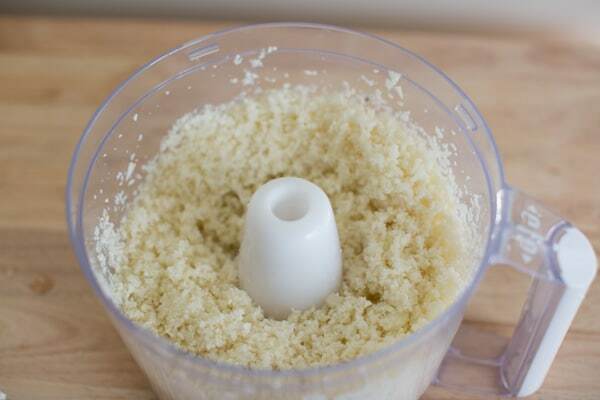 Pulse in a food processor to get a rice-like texture. You’ll probably end up with about 3-4 cups (I got about 3 and 1/2 cups out of mine). 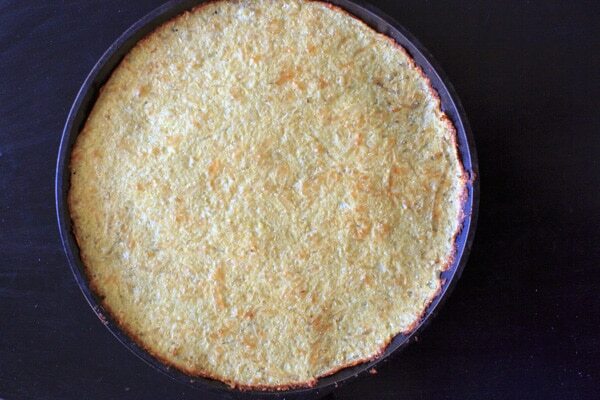 Tip #1 – since the key to a good cauliflower crust is getting as much moisture out as possible, it helps to dry out the cauliflower rice even before straining with a cheese cloth. Preheat oven to 350 degrees F and put the cauliflower in for 15-20 minutes. It would help to use a larger pan than the one pictured below so that it is more spread out. Tip #2 – After the cauliflower cools (important! 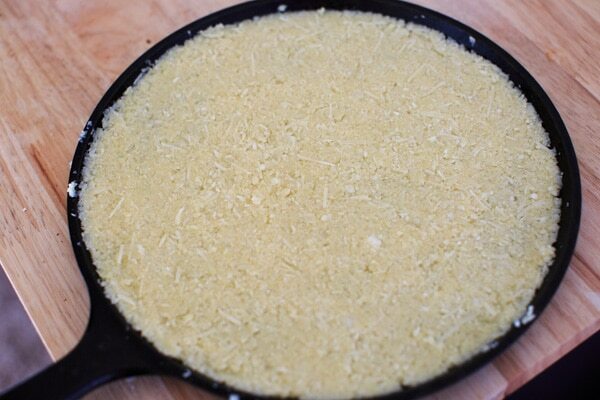 ), strain with a cheese cloth to get out as much remaining moisture as you can. Even when you think you can’t get out any more liquid, keep squeezing. Repeat. After this step I had about 2 cups of cauliflower, since most of the water is gone and it’s more compact. 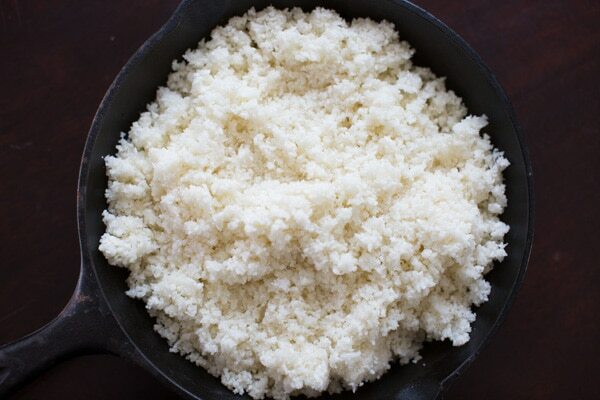 Mix this cauliflower rice with 1 egg, 1/2 cup cheese (I used parmesan), salt and herbs if desired. Spread out on a pan and bake at 450 degrees F for 15-20 minutes until browned and the edges are crispy. Congrats! 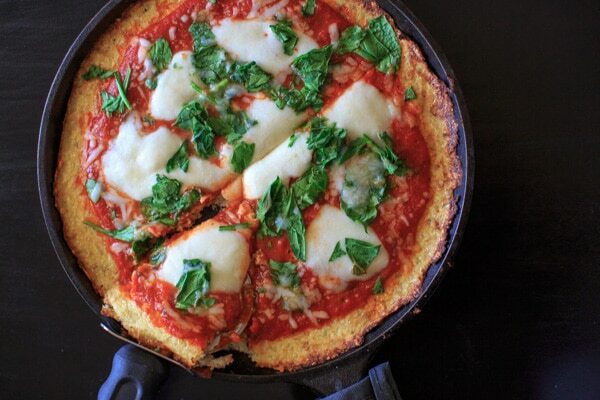 You made cauliflower pizza crust and survived to tell about it. Now add your favorite toppings and put back in the oven until the cheese melts. Then go tell everyone you know you just made cauliflower pizza crust and report back to me on their reactions. Will you try this? What other crazy substitutions for pizza have you tried? 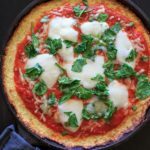 Cauliflower pizza crust - for those days when you really want pizza but not all the carbs, or need a gluten free alternative. 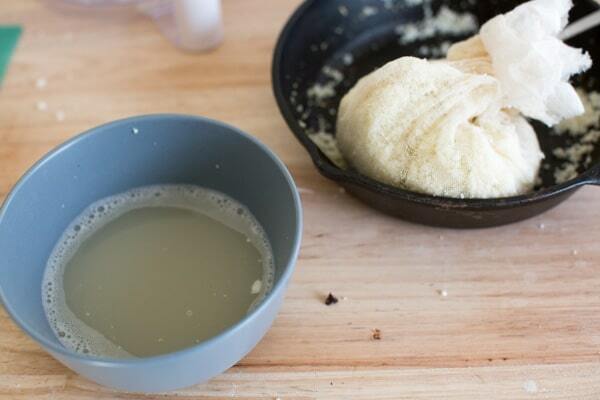 In a medium bowl, add strained cauliflower to the remaining ingredients and combine. 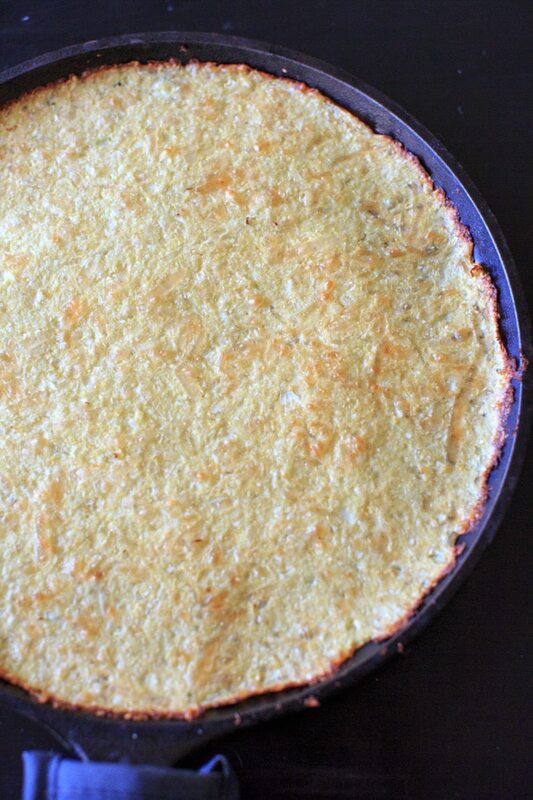 Form cauliflower mixture into a crust on baking pan. Bake for 15-20 minutes until browned and edges are crispy. Add favorite toppings and put back in oven if necessary until toppings are melted. For some reason it always seems like a big deal for me to pull out the food processor, but as I’ve been doing so more lately a whole new world has opened up! I hope you try it Lauren! Well I have never heard of it, but i am utterly intrigued! Thanks – I’ve got to try this. Let me know if you try it Adri! Thanks Jess, it’s been on my bucket list for a while now too. I look forward to hearing about your experience when you get around to trying it! The Moosewood Cookbook had a similar recipe years ago, but made w/ shredded potato! Wow! That was yummy! I’m looking forward to trying this one, too!